Many of us love the color and feel of a garage door made from natural wood. The beauty and curb appeal this material can add to your home, as well as the sturdiness it has to offer, can often outweigh the few disadvantages it presents. Let's start with the more obvious one - the look. Wood is often considered to have a classic and aesthetic appeal. As a result, a lot of surveys suggest that the curb appeal wood can add to a home is far greater than what a door from any other material can offer. Wood is also a natural insulator, which means it doesn't need to have additional material installed between its panels in order to help you maintain a desired indoor air temperature inside your garage. It can also be painted in various colors, and is less likely to need the same degree of repair compared to a door made of aluminum. Another advantage wood offers is durability. Although steel is more known for its capability of sustaining damage, wood isn't a lightweight in that department. It is certainly stronger than aluminum. The major drawback of choosing a wooden door is the price. Doors made from this material tend to cost more than ones made out of steel or aluminum. Wood also needs regular maintenance in order to remain in a good condition. It needs to be protected from various weather conditions that it will be constantly exposed to. Without regular application of protective coatings, wood can split or crack, swell and even rot. Although a wooden door tends to require more work from its owner, many people feel that the effort is usually well worth it. Warping and other damage to your door material can be prevented by carrying out regular cleaning and repainting of the panels. A lot of different materials can help you door resist rot and other issues. Another disadvantage wood has is weight. Because it is not as light as other door materials, a new door made of this material often requires a new opener as well, as it needs a certain amount of horsepower that not all openers are capable of generating. Before buying a new door, your best bet is to find a professional and ask them all of your questions. Our team at Garage Door Repair Brooklyn will be more than happy to help you find a door that's a perfect fit for your home. Contact us today to pick our experts' brain. Our team is capable of helping all local residents with a wide variety of different issues. As the best service provider around, we strive to meet and exceed all of our customers' needs. No matter what type of task you need completing, you can count on us to get it done. Check out the rest of our website to see what we can offer you today. Thank you for choosing our company! Feel free to browse our website for more information in the meantime. 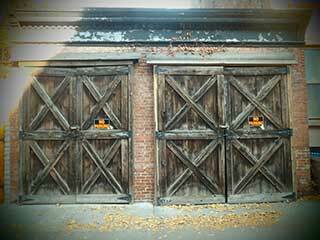 Our team at Garage Door Repair Brooklyn is at your service any time!